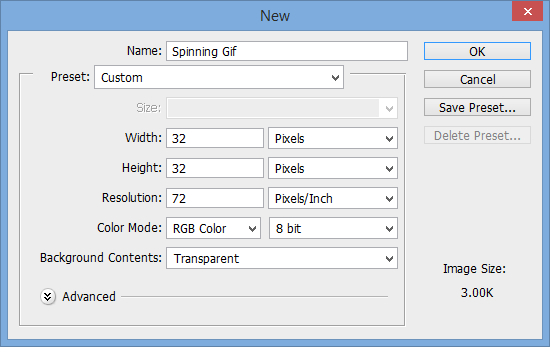 Did you know you can use the new timeline feature to easily create spinning .gif images? This is pretty useful for AJAX loaders, and here is a simple way to create it. Create a new transparent image with whatever size, 32 by 32 is pretty good. 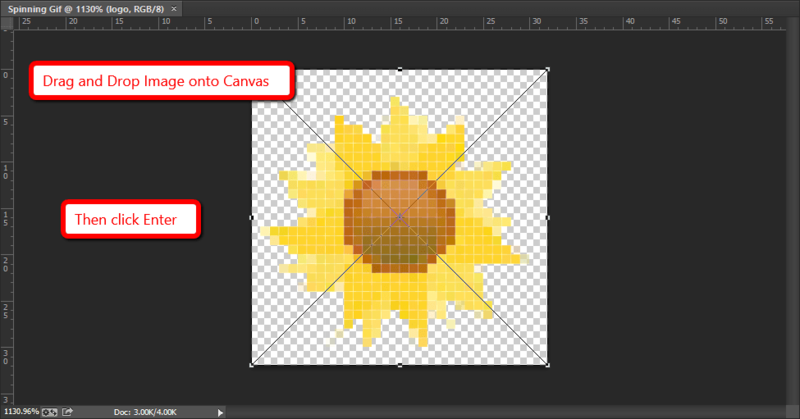 Drag in your image onto the canvas, and hit enter to confirm the paste. Open timeline by going to Window > Timeline, then click Create Video Timeline. If you see Create Frame Timeline, then click the little arrow to the right and change it to video. Expand the layer and start key framing Transform. Drag the pinhead of the timeline to the middle. Then, go to Edit > Transform > Rotate 180°. Drag pinhead to end, and repeat the 180° transform. Go to File > Save for Web…. 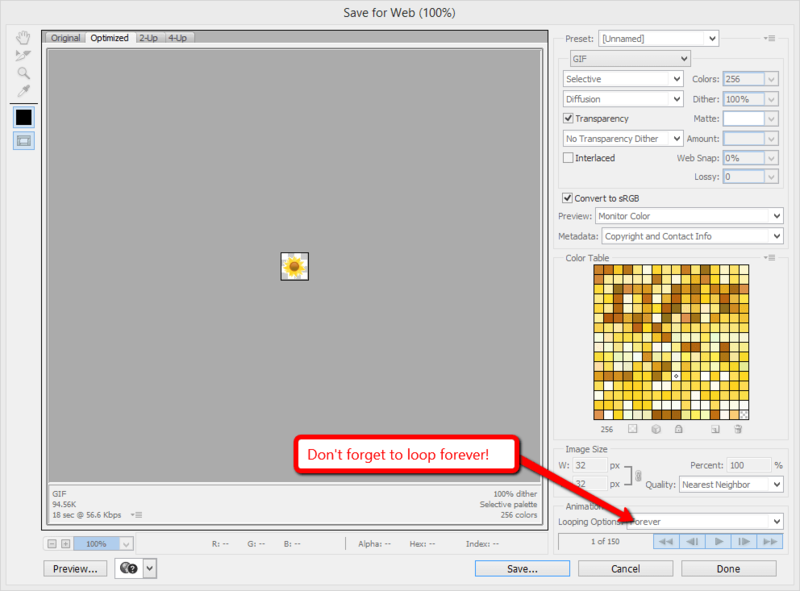 Then, don’t forget to change the looping options to forever, or else it will only spin once then stop. You’re done, now just hit Save…. Hopefully this tutorial helped you create a quick spinning animation in Photoshop and export into a .gif format file. Brilliant! I’ve been searching for a couple of days for a solution to this. Everyone else has some tedious workaround. This an incredibly simple way to solve the issue. Thank you!! Hey Bro, nice tutorial. But I don’t see any option for video/frame animation in timeline in my CS6, not even in the drop down menu. I really want to do in video animation. Please guide. which photoshop version is this? i m new to photoshop . i want to give spinning effect to sun. .
Hey, how do you eliminate the lag between successive rotations? I can only get it to do 180 degrees…dragging the pinhead to the end and rotating it again seems to just position it back to normal thereby causing the image to sit still. Any ideas? Can we change the animation speed here, if yes How ? If the transform property doesn’t appear, go to Layer>Convert to Smart Object, and convert the layer to a smart object. I did an animation with vectors, already labeled as smart objects, and it didn’t work at first. Just convert it to a smart object through Layer>Convert to Smart Object, and it will appear. thanks for this! sometimes it’s so unintuitive! You must have a smart object to do the ‘transform’ property, not a normal pixel layer. Hi There, when I start keyframing I don’t get ‘transform’ i get ‘position’. Is this the same? Becuase when I start to rotate the keyframes do not stick to the timeline and nothing happens. Hey, what is the name of the layer you see above where you see ‘Position’? When I tried with my version of Photoshop, an empty layer when expanded in the Timeline gives a row ‘Position’. However, after dragging in the image into the canvas, hitting enter, and expanding the layer (which is then renamed to the name of the file that was dragged in), the text changed to ‘Transform’.